On days that I work, I take the Metro train into DC and then walk about 15 minutes or so to my office. My route from the Metro to work is entirely dependent on the timing of the walk signals. If the walk sign is green, I go one direction. If it is red, I take a turn. This means I get to walk a different route almost every day. That first walk signal though. I don't know why, but it is almost always red, leaving me to make a right turn. Very rarely it is green, sending me on a route that, if the other signals cooperate, leads right past Alex's office. 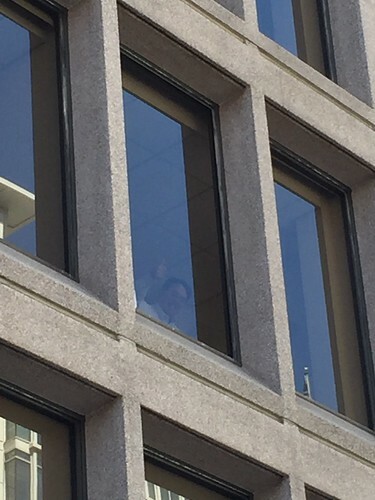 Today all the signals were in line and as I neared the corner by Alex's office, I texted him to demand that he wave to me. This photo wasn’t taken this morning, but you get the point. Alex, looking out of his window, must have seen my head explode right there. My best celebrity sighting yet. As a former union member myself, I felt a little bit bad being a big dork around this Very Serious Protest, so I made sure to read the ENTIRE flier that the guy gave me as penance. 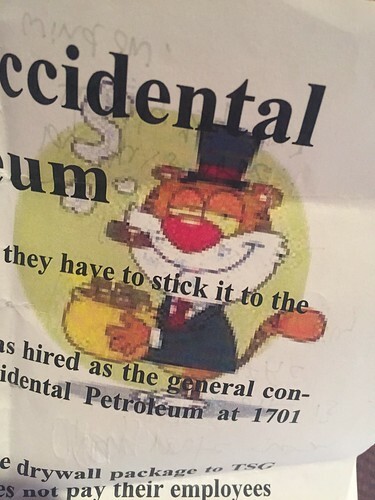 There was an actual picture of a fat cat on the flier. It’s like my morning was full of small presents, wrapped in awesomeness. Anywho, while this whole thing was going on, Alex was watching with his own special kind of joy. Evidently my backtracking for a photo and to get a better look did not go unnoticed by the guy handing out fliers. It turns out that I am neither subtle nor smooth. But I was delighted. As you know, I'm a big fan of rodents, especially weird ones. Add in a good cause and a rare DC-sighting of Alex? Well, that was the best block in DC this morning. 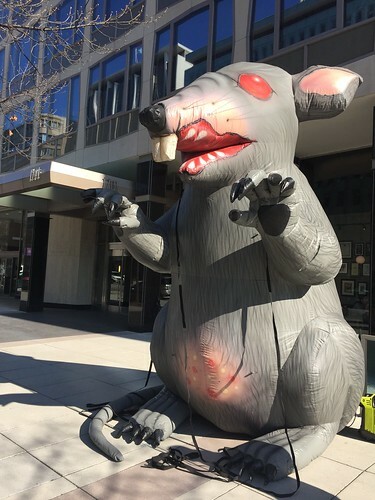 * "The rat stands for obviousness" should actually be "the rat symbolizes obviousness," but Alex and I always use it the first way, so that's how it stands here. If you have no idea what I'm talking about, look up Ralph Wiggum and The Debarted/Departed. 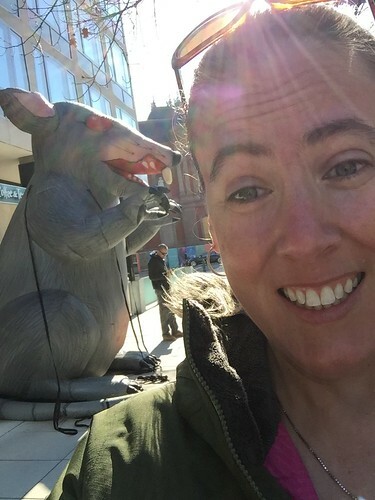 That selfie of you and Rat is is the best ever. the rat stands for obviousness and the cheese stands alone. or something like that. could possibly stand for. of course I could have simply read on, but that would have been too easy, so i stared at it for a while and decided that it had to be accidental scum. yes, that was definitely it. the cats became fat and then, accidentally, of course, became scum. no offense, but i like that better. oops .. not "stand for" .. be the end of. all that standing for muddled my word maker. I agree. Yours is better. I bet the union would agree.